I'll bet there was an engineer that earned his bonus when he redesigned from the early-early to the early-late style! That original setup is very complex. I always wondered what the trigger handle looked like on this setup. I like the whole t-brake release idea. Very cool!!!! The second design parking brake handle unit is identical to the Chev and GMC pickup trucks of the time. The early design is neat, but it looks like the engineer forgot the KISS principle. As I remember, our 60 and 61 Biscaynes had that type of release with a ratchet pedal. So it would be a natural progression to keep the handle and make the mechanism a handle. The handle release emergency brake was probably done by the same bunch who came up with the foot pedal emergency brake with the a dash release handle. Very common on the 60's GM cars. The foot pedal design was kind of neat since you could pump it more than once to take up the cable slack as the brakes shoes wore down. In an emergency when the hydraulic brakes failed you could keep your hands on the wheel since the emergency brake was foot operated. I can tell you it was very effective. 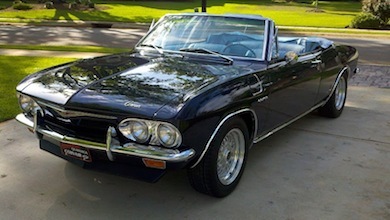 That said haveing a "T" handle for a release and another handle to set the brake in the Corvair seems rather awkward. Eventually the "T" handle/foot pedal was replace by a foot pedal you pushed to engage and pushed again to release on the full sized GM cars. It drove the dealers crazy since it looked the same and confused GM customers. "Hey I can't release the emergency brake, wheres the handle" calls were common the first year". Yep - nobody ever reads the manual. Great thread, love the history, love the suspense... Are you taking a part off the car then taking a picture then putting it back on? Or are you completely disassembling the car? > are you completely disassembling the car? I am just removing parts as I do cleaning and/or repairs.All the photos I have posted lately are file photos I took before car went into storage for the winter.I am trying to leave car as "factory assembled" if possible. > about a company that rebuilt tube shocks. Done quite frequently in Bolivia. Some pics of the original antenna installation, you can see in one of the pics the metal slug (looks like a flat washer) cutout sitting at the bottom of the kick panel area. The cutout would be fairly hot when it dropped down and it has melted into the body caulking a bit. I suspect that was a dealer installed antenna. A Factory antenna's mounting hole would have been created when the fender was stamped. Maybe all radios were installed by the dealers? all my EM's with radios have the same "hole slug" in the kick panel area. I guess in about a thousand years the scientists can analyze the "stuff" in the kickpanel area to determine when and where your car was! I am surprised you don't have lots of rust thru in that area. Here are some pictures of 60 air cleaner instructions, the orange silk screened instructions came on #272. The air cleaner that has a decal I think is Canadian,It was likely made by the Donaldson company in Chatham Ontario.You will note the orange silk screened instructions have a small AC logo, the white and yellow instructions have a larger AC logo.